On this page I will share my tech tips one at a time. Hope it will help! 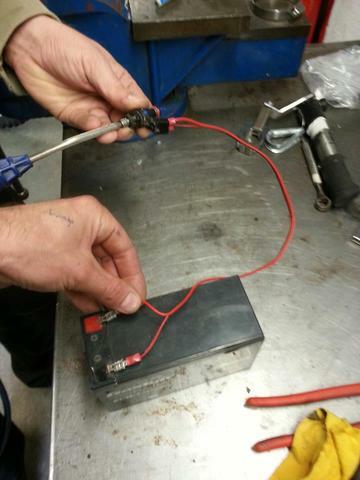 2: Connect cables to the injector, and connect to a 9V battery. 3: Spray rust remover, degreaser and air through the injector, open and close the injector several times. Repeat several times both ways. 1: Remove the injector from the motor. Leave the cables attached. 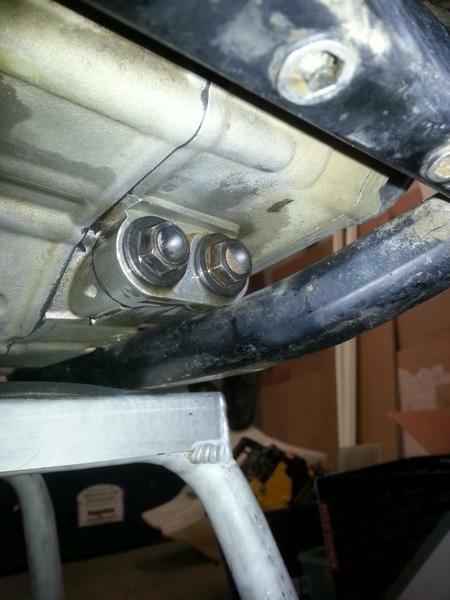 2: Connect the fuel line on the oppsosite side of the injector. 3: Press start to back-flush the injector. Once a year you service your chassis. The bearings last a long time if you maintain them. Toss the seals, wipe off the old grease and grease it again. The idea is to fill it completely so it's no room left for water. To press it together, bleed with a feeler gauge like this picture. All set for another year. 1: Oil is brown. No added colors are needed. 2: Buy 20 litre at a time. This will save a lot of money. 4: Smell the used oil. If it smells strange something is wrong. 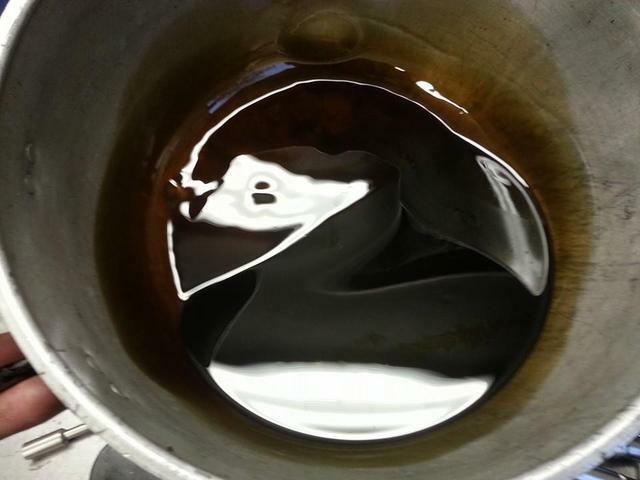 5: Old oil should look like the picture. Black, one color and no junk in it. Tired of bleeding forks? This is the way to treat them. First you clean and service them. Loose the plastic- or steel wear-ring. Then install a neoprene sleeve over it, all the way down, so if you bounce them they don't show any chrome. Use silicone spray underneath. Tape them tight and use steel wire to tie them down. The wire is also the wear ring now, but you can also use a zip tie. Now you can schedule you service, instead of those panic fixes. This aggrevates all KTM owners. It's the chain tensioner screw. 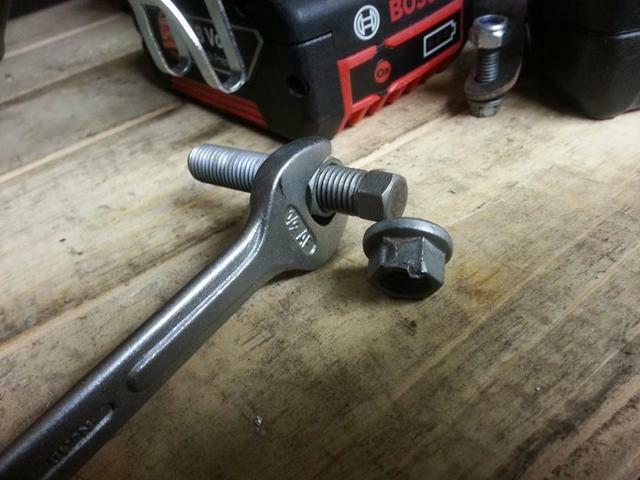 You assume the counter nut is 13 mm since the original tool kit has the 13 mm spanner, and get mad when destroying the nut. 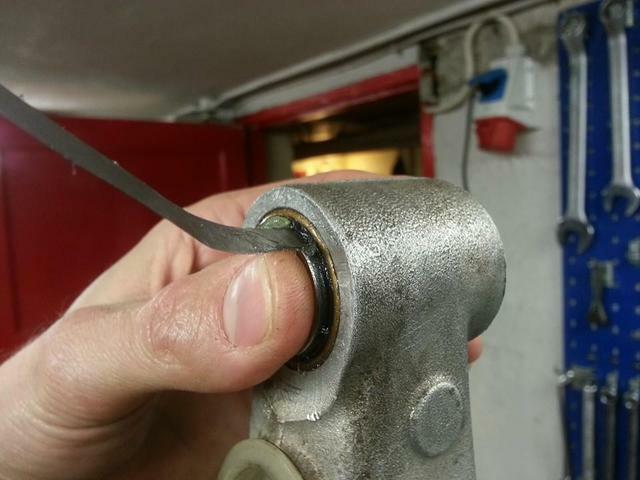 That's why it's actually 1/2", so get that spanner instead. The screw is not a standard M8 and I guess that's why the strange 1800-century thread. While trippin', you might consider raising it. Make a plate with about 40mm offset. I used a 3mm aluminium. Now it's easy to read. Get a remote while you're at it, and you're good to go. You have to be a hawk to see the numbers on the KTM odometer, and you can forget to read it while navigating. Take the front number plate off and cut the black wire in the three wire connector. Now it's unlimited, unlocked and you can choose trip 2 on the big digits. Still small, but s cheap fix. You also can add and subtract the trip 2 with up and down button, and this works with the stock remote as well. Ktm uses 1/2" oil plugs. That's why you destroy them using your 13 mm tools. Buy a 1/2" wrench and smile (from 2012> it's 13 mm). 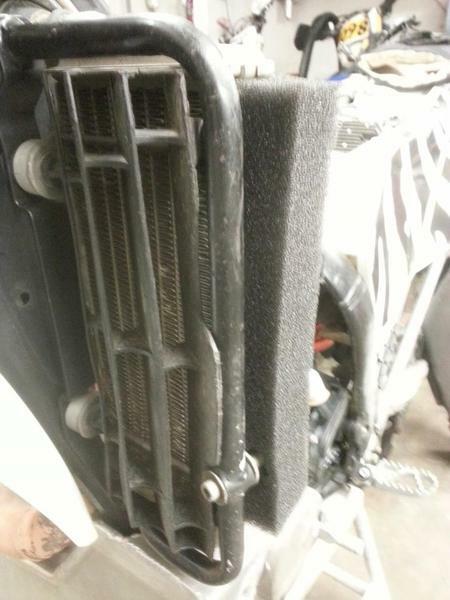 Radiators only work when air flows through so make sure there's no gap on the sides. Common when installing a third party tank. Use foam to fill the space. Tight seal means higher air pressure in front of the cooler and therefore better air flow. 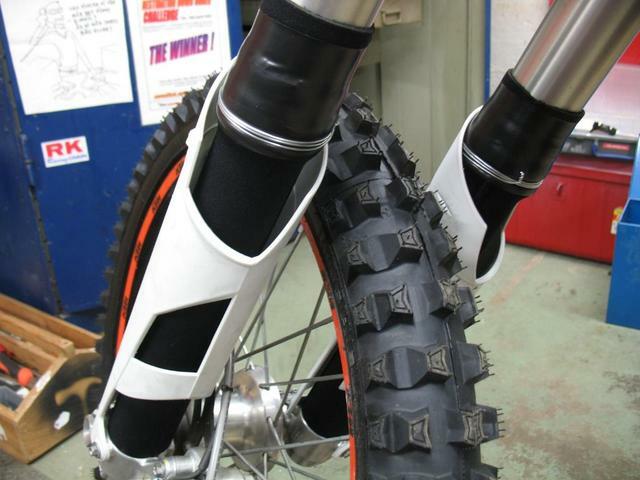 A low front fender is also a good idea if you're looking at a rally bike, and skip the idea of guards or mesh in front of the coolers. Use the stock plastic. Lost this KTM-screw lately? Obviously a weak link. Take it off, drill a 1,5 mm hole and fix it with steel wire once and for all. To be 100% sure you've got the right tension, follow this guide. 1: drive at least 1h on a new chain. 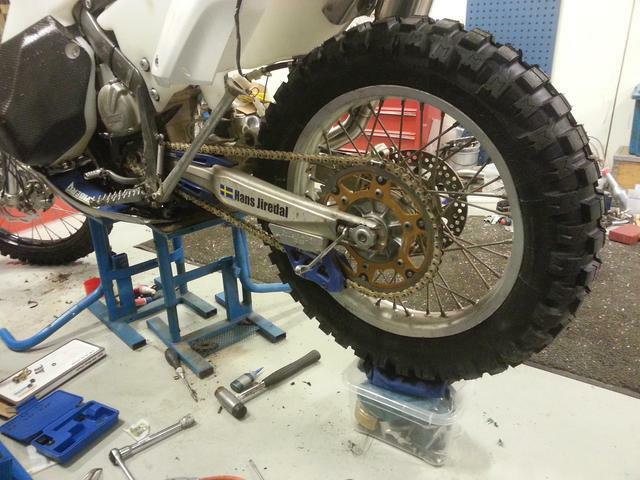 3: Put the front sprocket, swing arm axle and rear wheel axle in a straight line. 4: Tension the chain til about 1 cm slack. Pretty tight. lift the wheel and it should run smoothly. 5: Adjust straight and lock. 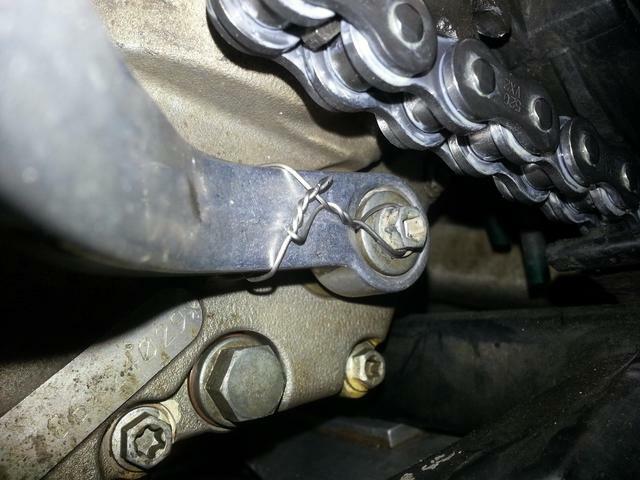 When installing a new drive chain, I like to be able to open it if I need in the bush, so I use a chain clip. When installing this, pry the chain tight to the clip lock. Common misstake to forget it and then the clip wears much faster. Ready? Everybody likes a cold winter, except maybe the motor. So when the temperature drops below zero, mask your coolers like this. If it boils, remove some of it. 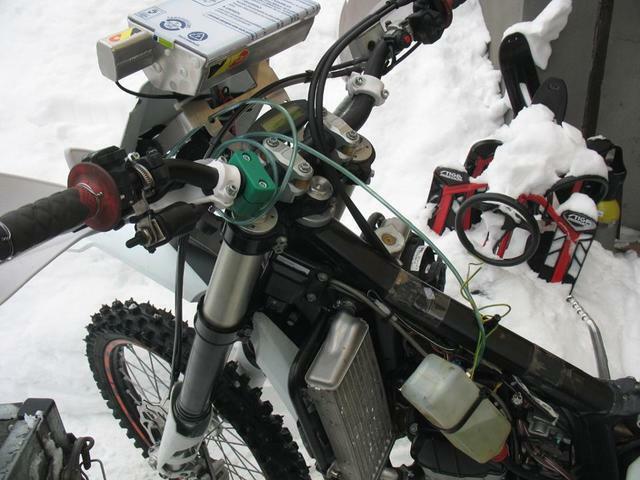 If you ride in deep snow, keep an eye on the coolers so you don't fill them with ice. Also, remember to idle longer before you go. 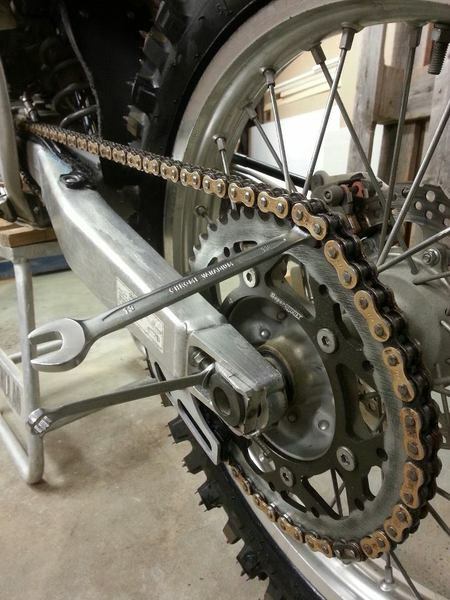 When adjusting the chain first you tighten the axle nut just a bit, adjust until you're happy. 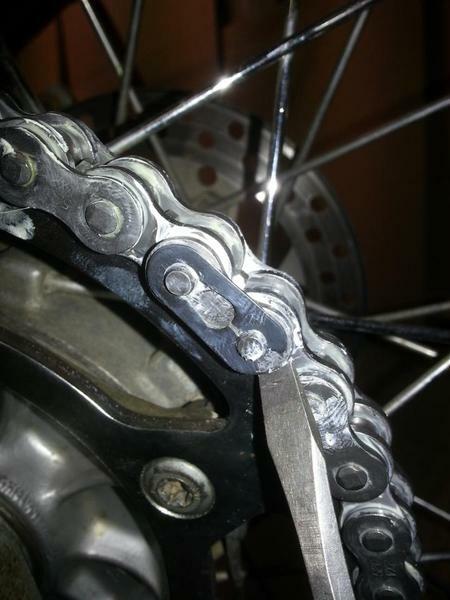 To make everything tight you jam a wrench between the chain and sprocket and turn the wheel. This pulls everything together nicely. Now tighten the axle nut, remove the wrench and double-check it's still straight. 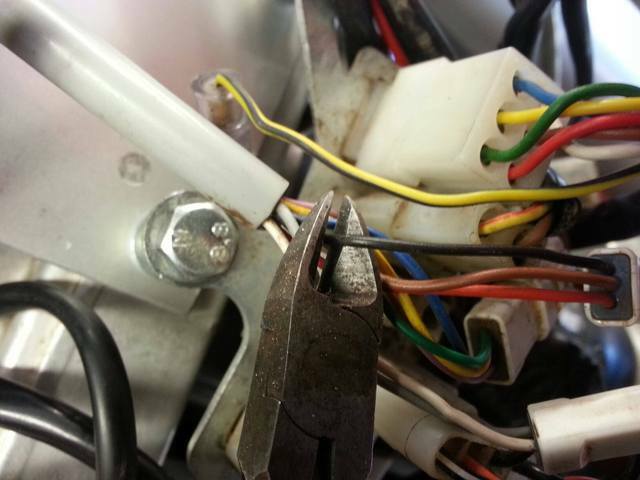 Remember the counter nuts on the adjust screws. All good? Let's gooooo! 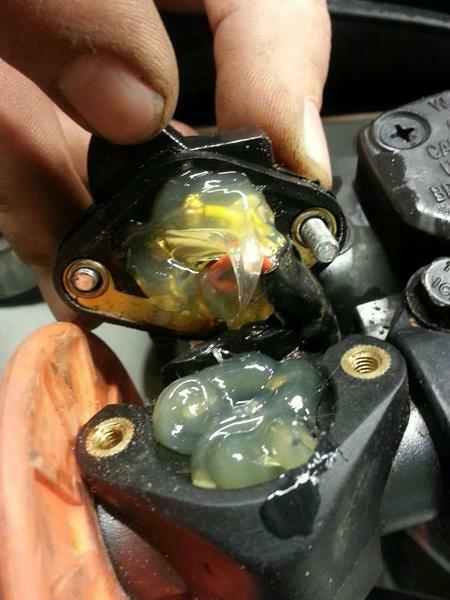 Ever heard squeaking brakes? Most annoying but there is an eazy fix. 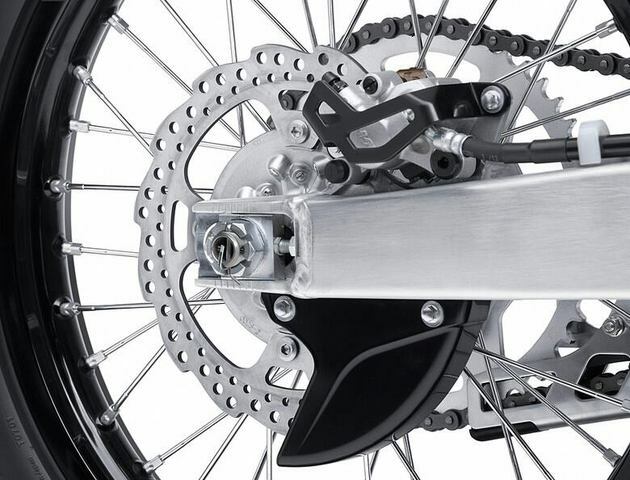 The noise is the vibration between the brake pads, caliper and holder. The quick fix is dirt and water on the brake disk. This puts new grooves on the pads and sometime does the job. The real fix is to grease the backside of the brake pads with copper grease. Vibrations be gone. Metal against metal also creates this sound, so check that you have at least a mm or so. When testing the motor, testride or fiddle with the engine you need the fuel tank. 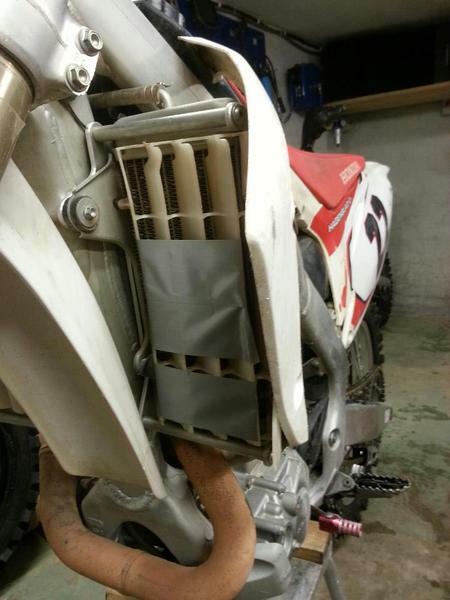 If your bike have a carburator you can build a mini fuel tank. Take a half-litre bottle, install a pipe connector to the lid and a breather to the bottom like in the picture. Now you don't have the standard tank in the way whlie tinkering. 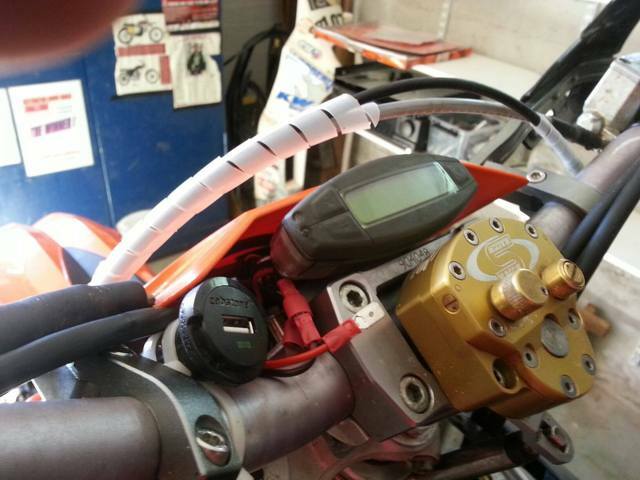 Tired of the crappy multiswitch on your ktm or husaberg? We all hate this and nobody knows why they never change to something useful. Anyway, open and clean with compressed air and fill with grease. This keeps the worst mud out for a while. When the stop-, light-, or horn button doesn't work you do it again. When maintaning the swingarm and other chassis bearings, clean off the old grease and use marine grease here. This is more sticky and keeps water out. Make sure to do this once a year, change seal rings and the bearings will last forever. On KTMs you need to to do this on brand new bikes. 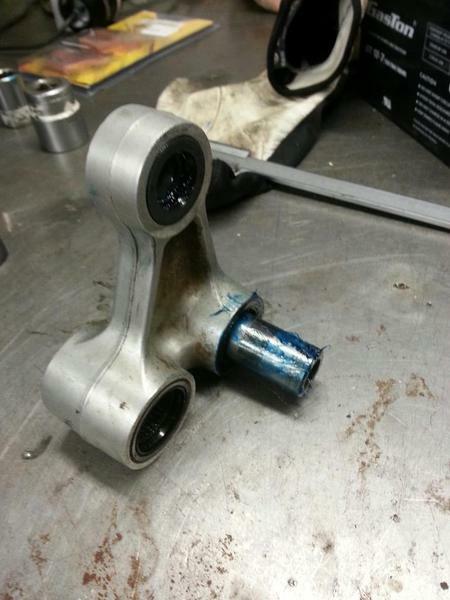 Don't forget the steering axle bearing. Also, never power-wash near bearings. 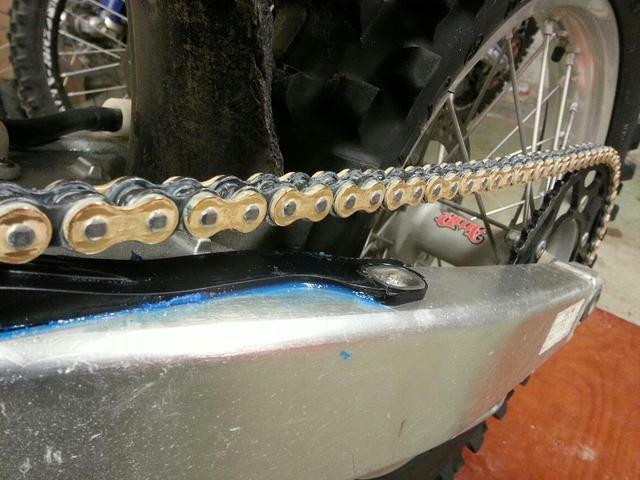 Glue your chain protector to the swing arm using silicon, and it will keep dirt away that can grind the material. Also it lasts longer, and no flapping noise.